I was looking through my Recipe Index the other day and realized I had done something unforgivable for a baking blog -- I was missing a really good brownie recipe. I've tried making brownies at high altitude before, but I haven't really had much luck. There's always been something a little off about their texture. The first recipe I tried was from Pie In the Sky: Successful Recipes at High Altitude; I found this recipe to be too cake-y. I wanted a dense, chewy, chocolate brownie, but this tasted more like chocolate cake. The second recipe I tried was actually the brownie recipe from the Hummingbird Bakery Cookbook; I figured that since the recipe contained no chemical leaveners, it wouldn't take too much to adapt at high altitude. I tried baking the recipe at a higher recipe temperature and it seemed to work okay -- but the texture was still not ideal. The resulting brownie was too chewy and thin. After these two less-than-ideal brownie attempts, I began to notice something around Denver. Call me paranoid, but he city seemed to be suffering from a major shortage of good brownies. Every brownie I had had in the city was too cake-y (e.g. Ink! Coffee), disguised as something else (e.g. as Napoleans (?!) at District Meats), or made elsewhere and shipped here. It seemed like making brownies in Denver was an impossible task, one that even seasoned professionals had difficultly with! 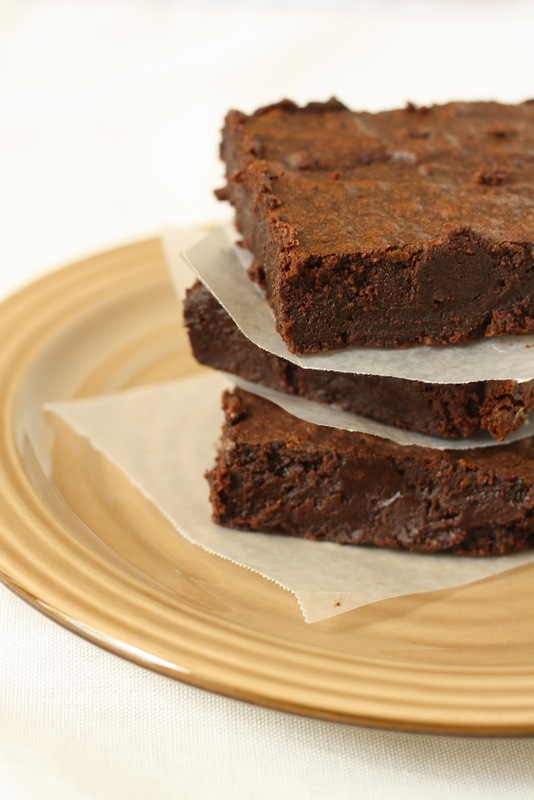 So when I saw this recipe for Chocolate Bourbon Brownies from High Altitude Bakes, one of my favorite high-altitude baking blogs, I was excited. 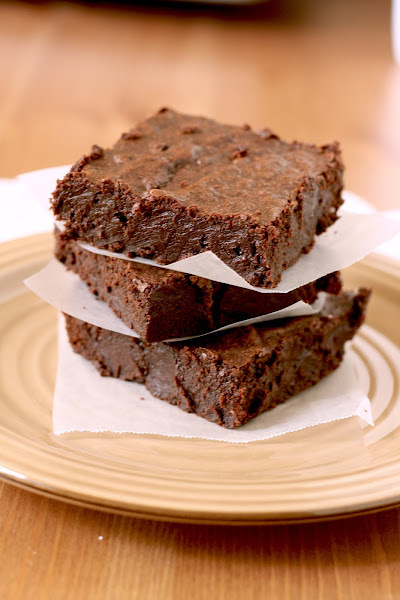 Chef Megan, the author of the blog and an actual pastry chef at a Top Chef restaurant in Vail, even makes the same observations about the difficulty of finding a brownie recipe that works at high altitude that I did! I was determined that this recipe was going to be a winner, especially since it was based off Oprah's favorite brownie recipe. Indeed, the recipe produces fudge-y, dense brownies with an intense dark chocolate flavor. They were delicious. I did make one minor change, however. While Chef Megan replaces the brownie's vanilla flavor with bourbon (calling it her alcohol of choice), I decided to try replacing the bourbon with Grand Marinier, an orange liqueur that's essentially a cognac distilled with the essence of bitter orange. I love chocolate-orange as a flavor combination, and I was hoping that the Grand Marinier would infuse the brownie with a faint orange flavor that would complement its dark chocolate flavor well. 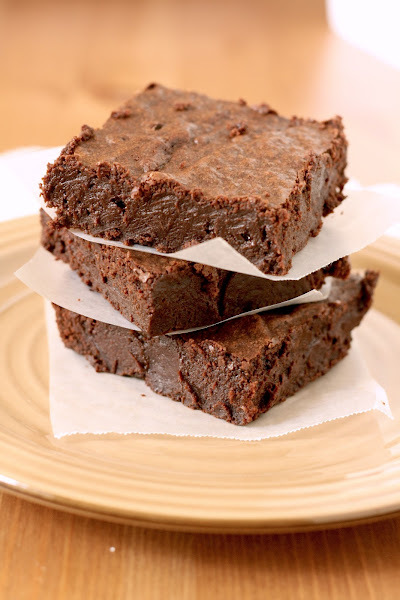 In truth, the Grand Marinier was very subtle in this recipe and only noticeable in the brownie's aftertaste. Next time, I think I'll try adding a teaspoon of actual, freshly-grated orange zest for a more noticeable flavor. Preheat the oven to 350 (F). Line a 9 x 13 inch pan with aluminum foil and coat generously with butter or baking spray. In a double boiler, melt together the chocolate and butter, stirring together the whole time to distribute the heat and prevent burning. If you don't have a double boiler, you can use a medium glass or metal bowl and set it atop a pot of boiling water -- this works just as well. Remove from the heat once the mixture is smooth. Add the sugar and brown sugar to the melted butter and chocolate. Whisk in three of the eggs until combined. Add the remaining two eggs and whisk until combined. Add the Grand Marinier and stir to combine. Do not overbeat the brownies at this stage or you will get cakey brownies, rather than the fudge-y kind that this recipe seeks to achieve. Sprinkle the flour mixture over the batter and use a spatula to fold in the flour mixture into the chocolate until just a tiny trace of flour mixture is still visible. Pour the batter into your prepared pan and bake in the center of the oven for about 20-25 minutes until the brownies are just set. For sea-level, bake for 25 - 30 minutes and rotate the pan halfway through the bake time. A toothpick inserted in the center should come out with just a few moist crumbs sticking to it. Place the pan on a cooling rack and allow the brownies to cool completely before cutting into squares. I love Grand Marnier in desserts! What a great addition to brownies. This looks so sinfully delicious and so fudgy! Yum! :) The photos are also beautiful. I'd love to make this but my oven is too small for a 9x13 inch pan. How do you make the adjustments if you use instead an 8x8 inch or a 9x9 inch square pan? Thanks for sharing this recipe. I'm not really sure about this but I would divide the batter up into two batches for 8-inch/9-inch pans and just cook them separately. If you're using an 8-inch pan, I would bake for 20 - 25 minutes (or until the brownies are set). For a 9 inch pan, the brownie batter is going to spread out more thinly, I would bake for 15 - 20 minutes. Let me know if that works! I'll try experimenting with this recipe sometime this weekend too to see what the smaller pans' output would be. I was drawn to this recipe just by the first word...I love the unique twist to the classic brownies. I just made this and it is smelling great! It's for a birthday, so I was wondering if there was a frosting that would be good on these brownies?